A Titanic expert has unveiled a plan to test the remains of 43 unknown victims of the disaster in order to identify them using DNA. Bill Willard wants to take samples from graves at three cemeteries in Halifax, Nova Scotia, in order to identify the unknown victims. The plan was endorsed by descendants at the annual meeting of the British Titanic Society (BTS) in Southampton. Graveyard authorities in Canada have turned down the request. However, BBC South transport correspondent Paul Clifton said there was still hope for Mr Willard's project as a similar refusal had been overturned. Image caption Bill Willard said his plan would give families "closure"
More than 1,500 people died when the Belfast-built Titanic hit an iceberg on 14 April 1912 on its maiden voyage from Southampton to New York and sank the next morning. Mr Willard, from North Carolina, said his plan would "put names on the graves of the unknown". He told BTS members at the meeting: "We want the families to have closure. We want to have something for them to be able to go and honour their family member that was on the ship." Mr Willard said it would take about six months to trace family members and carry out DNA tests. Beverley Roberts, whose great-grandmother survived the disaster, said the project was "a fantastic idea for families who don't know". Bob Burr, a descendant of first-class steward Ewart Burr, said: "When you bury somebody or lose somebody it's rest in peace. But if they discover that DNA match it might be he's there." However, the three graveyard authorities concerned have refused Mr Willard's plan. Blair Beed, whose grandfather was undertaker to the Titanic dead in Halifax, said: "I don't think it will happen. There is no will in Halifax among the cemetery authorities to do it and local people aren't that much in favour." Image caption The Titanic was the largest liner of its time and was said to be "unsinkable"
Will it happen? There is enduring fascination with the Titanic story. Uncovering the identities of the bodies in the 43 unnamed graves spread over three cemeteries in Halifax would clear up some of the very few unknown details of the world's best-known maritime disaster. But there's a debate to be won between leaving the dead to rest in peace or entering their graves in search of new knowledge. Support for the project from British descendants appears strong. But the decision is not theirs to make. It's a matter for the cemetery authorities in Halifax, and they are not keen. They wouldn't be opening up each grave entirely - small holes to extract samples of bones or hair would be sufficient. And there is precedent. 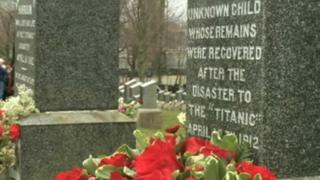 Fairview Lawn Cemetery hosts the grave of "The Unknown Child" - a one-year old boy who died on the Titanic. DNA testing in 2008 revealed him to be Sidney Leslie Goodwin from Melksham in Wiltshire.